I say: Comin' at ya! such an amazing makeup artist! you can do and pull off any look. Yay!! 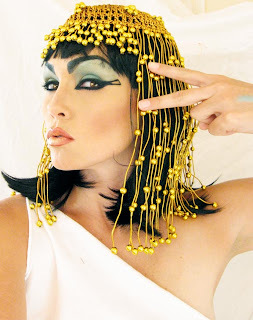 I can't wait to see how you did this Cleopatra look! Seriously, I haven't been this excited about Halloween for the longest time. Thanks so much Kandee for all your hard work! I know you read the same comments a lot but I just wanted to thank you. I see how much time and heart you put into all your videos and blogs and I just wanted to let you know that I appreciate all you do. I know you work very hard so thanks for being so great to us and sharing your amazing talent. It helps so many of us. This is my favorite look in this series that you have done so far! This look is beyond gorgeous on you!! I can't wait to see the video! Thank you for sharing your talent and beauty (inside and out) with us. I always look forward to seeing your latest blogs and videos! I LOVE your costume/make up series! How about a Poison Ivy look? It's gonna be my halloween costume! THAT'S GREAT!! I was actually going to request that. gorgeous. thanks! Can you Do an Angel look? GORGEOUS!!!!!!!!!!!!!!!!!!!!!!! You are soooooo talented! oh my goodness!! I'm a make up artist myself and I just found your blog and video's! Brilliant!! I'm always interested in what other make up artists tips and tricks are, to see if we do the same things or to learn something new! your video's are wonderful and I'm going to make my way through them and try to watch them all. I just watched a couple of video's where you asked for feedback on somethings. You were wondering what kinds of video's people wanted and obviously I would want to see more make up video's, but I also liked your ideo for hair do's. Also I'm trying to work on my portfolio and you did a video talking about showing key looks to have in a portfolio and I'd be VERY interested in those video's. Please please do a video on key portfolio looks!! (luckily my husband's a photographer so I'm set in that area:)) Also do you have any tips, tricks or products to use on fine lines/wrinkles under the eye??? Keep those video's coming!!! oh my goodness!! this would have to be my absolute favourite so far out of your costume looks! I just found your videos a couple of days ago and I LOVE THEM. Your videos make me want to bring out my inner artist and just paint away on my face. You are so happy and so inspiring. I love you videos!!! I was wondering if you could do an alice in wonderland look, and when the costume series is over, a Cheryl Cole look. Love you and your videos!! Pizazz from the Misfits of Jem & the Holograms fame. I used to rock out to that show. (Um talk about fashion!!!!) Did you? Keep on being awesome . . .
oooooh, this one is gonna be fave I can tell!!! Just curious, did anyone ever win the other contest about how you influenced our lives? Just wondering! You are awesome Kandee!!! Oh my goodness your Barbie video- crack me up! I even posted it on my blog. You did a fabulous job! Hope you have a lovely weekend! This is so awesome! Good job! You're on a roll Kandee!!! I'm already loving this look. I LOVE LUCY I LOVE LUCY I LOVE LUCY!!!! Please do a Halloween look for I Love Lucy. I think it would be so fun and i am going to be her this year for Halloween! I love watching your videos! I'm a young newlywed, and spend most of my days at home, when not at work. I watched some of your make up video and tried them out, my husband loved what I had done. Thanks so much!! U are soo good - and You have no idea how inspired I get by You! This is crazy amazing!! You look just like Elizabeth Taylor in Cleopatra. Can't wait for the video! How I have enjoyed ALL of your tutorials! But, everytime I think of one to do on my channel, I come here and it is one of your next ones! LOL! I think I have a couple in mind that maybe you won't think of...maybe! LOL!!!!! I love you girl! The barbie vid was freakin priceless...OH...you are seriously a GREAT singer! Love you! PLEASE PLEASE do Betty Boop. I am going to Trick Or Treat with my daughter and She loves Betty Boop (and halloween). I would love to be able to come out looking just like her. I love your videos. I tell everyone to watch them. So many people have thanked me for turning them on to you. Love it. You are awesome. Thank for the peak Kandee, it looks wonderful as usual! oh and one thing I noticed and makes me giggle everytime, you always leave the make up you tried on the back of your hands, same in the Barbie video haha so cute! Hey kandee thanx for the lovely styles that u come up with..as i always say u r BESTEST at ur job.. I luv 2 read ur blog.So r so inspiring.Everyone in this world has some pain but to come out of it and inspire others to overcome it is the best thing that we can do for each other..
Thanx for ur encouraging words i like it a lot..
Haha dude! I was cleopatra for Halloween one year and I had a gold headdress JUST like that. I loved it sooo much... I felt like such a queen, haha! can you please do a CRUELLA DE VIL look please!!!!! This looks great! I can't wait to watch. I know you hear it a lot, but thank you for your videos! You help girls look and feel beautiful while boosting their self-confidence. I love what you do and love to you for doing it! I was at a group interview for MAC and a clearly more experienced artist mentioned your name. The next day, I come across your youtube video for the barbie look which lead me to your blog.. I must say, you have a new admirer! I love your techniques and just by watching one video I have learned several new techniques and new favorite colors I want to run out and buy! I am an aspiring make-up artist and I would love to know where and how you got your training!? Did you go to schools? And which ones? I saw a video where you were talking about schools but I didn't catch if you mentioned any that you went too! Hey Kandee! I have to say that I look forward to your video posts! It is what I watch everynight before I got to bed! i have been telling all my friends about your videos and that they need to watch them. So i have an idea for a costume.. can you do a fairy with bright colors on the face with swirls and things like that.. oh and lots of shimmer! I think it would be so cute and artsy! Keep em coming! Your Cleopatra video is my all-time favorite! LOVE LOVE LOVE! haha you are great =) keep it up . i randomly found ur barbie video through blog and here i got ur blog haha.. smiles ! Hi Kandee, it's me again..I just wanted to let you know how much I enjoy watching all your videos, especially the most recent ones! You're so captivating and I love the positive spirit you share every single time. Well I stumbled upon one of your videos on YouTube and I've been watching them ALL NIGHT. I'm going to look like a supermodel tomorrow at work lol! Anyways, I just wanted to tell you that you are WONDERFUL!!! "There are a number of unverifiable stories about Cleopatra, of which one of the best known is that, at one of the lavish dinners she shared with Antony, she playfully bet him that she could spend ten million sesterces on a dinner. He accepted the bet. The next night, she had a conventional, unspectacular meal served; he was ridiculing this, when she ordered the second course — only a cup of strong vinegar. She then removed one of her priceless pearl earrings, dropped it into the vinegar, allowed it to dissolve, and drank the mixture." "Plutarch indicates that "her beauty, as we are told, was in itself not altogether incomparable, nor such as to strike those who saw her." Rather, what ultimately made Cleopatra attractive were her wit, charm and "sweetness in the tones of her voice." You are such an inspiration, I especially love the last 3 blog posts you have done. The Queen of Hearts, Barbie and now Cleopatra, Wow. You keep it real, I get a real giggle watching your posts. OMG.U are damn talented Kandee.U're like a ray of sunshine.so happppy and u always make my day when I watch ur vids.Ur personality is infectious.Have a great day!! kandee you really go all out for us, and thats really sweet of you. giving up sleep to edit a video for us. you're honestly one of the kindest person i have ever met, which is a really rare thing. i think elizabeth taylor would be jealous if she saw the video; you look ten times better then she did. KANDEE!!! We listen to the same kind of music so I wanted to tell you about my favorite station! Its best to listen during the week cause on weekends they play abscure type stuff but I think you'd love it! Like I do! Love the make up and no fake lashes this time! I have trouble with those...they always feel like they are goin to fall off! UGH! OH could you talk about brushes...which ones are must haves and how to clean em. THANKS! Wow! I"m on GLAMOUR magazine's blog!!!! CYNDI LAUPER!!! Girls Just Wanna Have Fun!!!!! Jem - 80's rocker power!!! Which 80's rocker should win?!? Barbie - not just plastic! Sneek Peak for my blog family!!! Ahhhhh before & after of a not-fun-kind! PLEASE VOTE FOR COSTUME LOOK!!! oh my gosh!!!! Lauren Luke likes me!!! Do you want bigger eyes?!? Never before seen Kandee -post shaved head! Kandee's Food Network: Holy Cupcakes, Batman! The Tally So far for GLAMINAR!!!! Flat, Matte, and Kandee Approved!! !